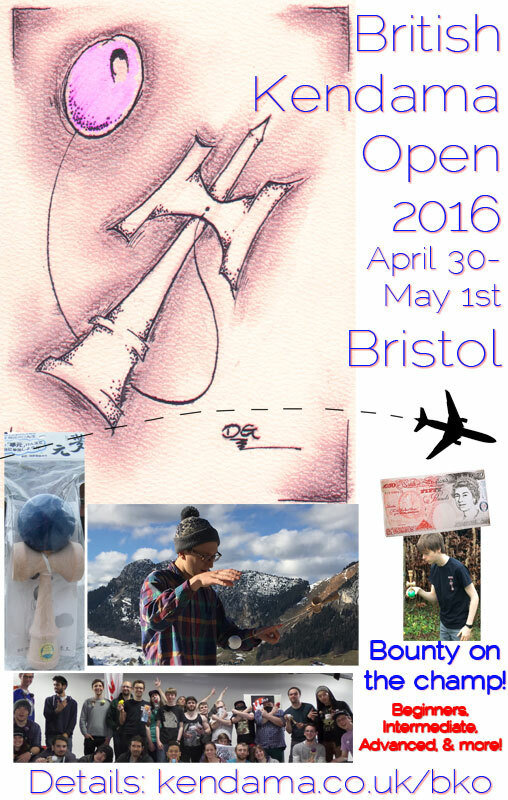 BKO 2016 will be in Bristol. May 2nd, (Bank Holiday) Monday.... anyone still around? Chill-out day, with Monke in the evening. UPDATE: Win a flight to Japan! SATURDAY UPDATE: The Omnium competition will begin at 13:30. Details of the competition will be revealed on the day. UPDATE: £60 cash for 1st place in the Dan Jam. 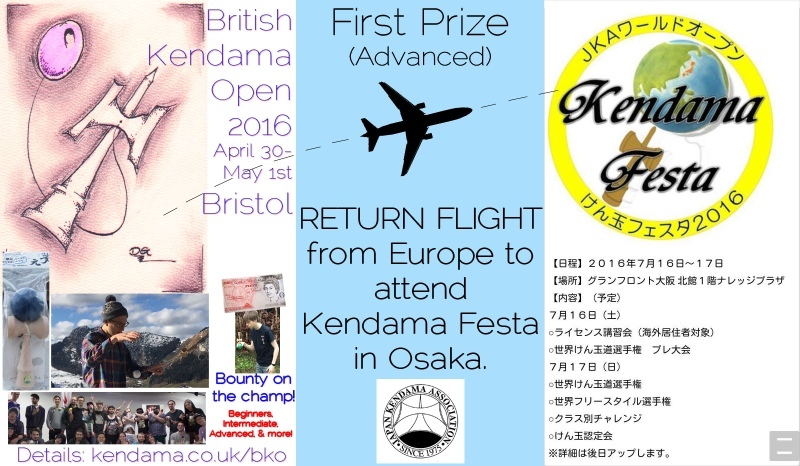 UPDATE: Royal Kendama are going to livestream the BKO! Follow them on twitter (@RoyalKendama) and/or Bambuser, for live links to the stream. UPDATE: Table booked for Sunday night pizza! UPDATE: Sunday. Bit of a walk to cashpoints. So BRING CASH WITH YOU. UPDATE: Saturday. Could be showery. Bring a hat and coat! We'll dodge into coffee shops if needed. UPDATE: Monday chill-out in Castle Park (afternoon) and MoNKe & pub (evening). (See http://kendama.co.uk/monke ). Q. Do I have to buy a ticket? A. No, just turn up on the Sunday and pay for whichever divisions you wish to enter. Q. Where shall I stay? A. Check out where the Social and Competition days are being held, and try to find a hotel or Air B & B nearby. Bristol isn't too large a city, so as long as you're not way on the outskirts, you'll probably be within 40 minutes' walk. Q. I've never been to a competition before. Is it okay just to watch? Q. Will you be doing gradings at the weekend? A. We will try to fit in some gradings first thing on Sunday. But we have time constraints to get everything done, so we can't promise. On Saturday, if the weather permits, we may have more time to do some gradings. We will meet in Queen's Square, between 12:30 and 14:30. We'll then move to Millenium Square Landing/Millenium Square for a change of scenery. We may move on to College Green later on. In the evening, we'll go for a meal at a nearby Indian restaurant. UPDATE: The Omnium competition will begin at 13:30. Details of the competition will be revealed on the day. 1. If you were at the 2013 Bristol BKO social day, we can promise you... LESS WALKING! Mmm, 35£ a return ticket from Dublin. I'll consider it. Wow @shalafi thats very reasonable. For me coming from Ramsgate Kent it will probably take me twice as long to travel and twice the price by car or train and similar, but a lot longer by coach. Am hopeful of coming though! Quick question regarding bko. I had been jamming a yellow ozora i intended to use. However the sword is dyed a light green colour. Will this be disallowed? Stained kens are not specifically mentioned, but would appear to come under "adding any markings". However, judges are also allowed to use their discretion, so if a judge felt that a stained ken did not give any advantage, and also had not affected how the surface of the wood might play/feel, then she may be inclined to allow it. It would definitely be on a case-by-case basis though, so the kendama in question would have to be seen and approved by the judge. I really hope to make this event and will probably have the family in tow (wife and two skids). Air B&B is probably worth a look. Great to hear you're planning on coming. Cheers @The Void I will look into that one. Ah ha its a B&B search engine. No, airb&b is for private people only. There are no professional b&b there, only normal people that rent one room in their house. It's cheaper than normal b&b, as most of the new 'cooperative economy' sites. @shalafi I see that now. Looks like quite a useful site. And there seems to be some very reasonable prices around Bristol. Out of curiosity I also checked Tokyo and prices there are even cheaper!! @KenSan I was just making sure that you get the concept right. It is a more personal stay, some people like it better, some don't. Also, the quality of the experience varies a lot, some people are amazing hosts while others just want some extra money and don't care. Used the Airbnb and booked some accommodation near Redcatch park area. I shall be flying solo so no kensan jnr!